Jade Lally is looking to lay down discus marker! JADE LALLY says she is looking to hit the golden standard of 62 metres next year as she looks to fulfil her podium potential. The former Crawley Athletic Club discus thrower was recently confirmed by UKA as one of the athletes supported by the World Class Performance Programme for next year, meaning she will continue to receive funding from the National Lottery. It is confirmation that the 26-year-old is recognised by the national governing body for British Athletics as having podium potential for the Tokyo Olympics in 2020. 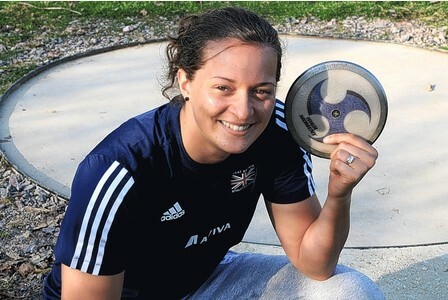 And while it has come as a bit of a surprise to Lally, who was snubbed for a place at the World Championships in Moscow earlier this year despite being the best female discus thrower in the country, the Crawley athlete is delighted with the funding. She said: “It is a little bit odd, because it is based on potential and the reason I didn’t get selected for the World Championships was because they decided I didn’t have potential. “It does seem inconsistent and I still don’t understand the decision not to select me for the Worlds. “But I am not complaining. I am definitely happy to have the funding and grateful for the support. Lally is unlikely to be competing until at least March, when she could feature at the European Winter Championships in Portugal or the World Indoor Championships in Sweden. However, she is now back in training and working hard in the gym to prepare herself for another rigorous season, when she hopes to set a new personal best and break a milestone she has been targeting for a few years. “It is important for me to throw 62 metres,” she said. “I have been trying to get there for a few years and, on a global scale, 62 metres is a bit of a marker. “It is something you really need to achieve to be considered up there with the best, although 60m is the entry standard. And to help her achieve that, Lally is spending a lot of time in the gym at the K2 leisure centre and in Horsham, adding that it is important to put the “hard graft” in now to reap the rewards later. Meanwhile, she is also in the rare position of being able to put on weight to help her bulk up in readiness for competition, with Lally targeting a weight gain of four kilograms in four weeks. She is almost two thirds of the way there and she says that while she can allow herself a few more luxuries, it is not as easy as it seems. She said: “I have always been one of the skinniest in the discus circle and it is about me getting a bit stronger. “I am trying to counter that by putting some weight on aggressively to help me in my training, but it is about striking the balance between strength, speed and flexibility.